The current line-up of Vertigo titles covers a wide range of genres. The Sandman Universe books spotlight different approaches to fantasy, American Carnage offers a politically charged crime yarn, and Goddess Mode and High Level give readers stylized sci-fi stories with bold aesthetics. Written by former Nine Inch Nails art director, Rob Sheridan, High Level is a series that depends on its visuals to pull readers in, and artist Barnaby Bagenda and colorist Romulo Fajardo Jr. bring Sheridan’s ideas to the page with a rugged dystopian cyberpunk sensibility. 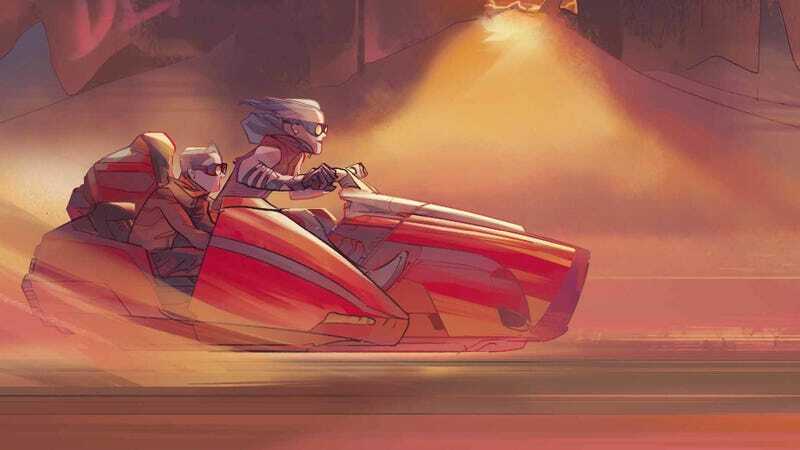 The book’s hero, a brilliant young woman named Thirteen, is charged with bringing a superpowered young girl back to her home, traveling across treacherous terrain on her way to the elevated utopia of High Level. The opening of this exclusive preview of this week’s High Level #3 spotlights the political commentary at the core of the titular locale, contrasting its sanitized paradise with the dirty, barren world that Thirteen moves through. This issue features the addition of artist Amancay Nahuelpan to the art team, drawing the finished panels over Bagenda’s breakdowns. Nahuelpan takes over finishes with the final page of this excerpt, and while his linework is slightly more detailed, Fajardo’s coloring makes the transition seamless. Fajardo’s crisp digital painting brings a lot of shape and texture to the linework, and the page of Thirteen and Minnow traveling across the desert shows how changing the color temperature reinforces the sense of motion and the passage of time. Nate Piekos’ borderless word balloons fully integrate with the lineart, and the art team enriches Sheridan’s story with a confident, cohesive creative vision.